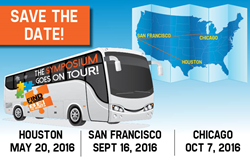 The Mesothelioma Applied Research Foundation announced its 2016 dates for its International Symposium on Malignant Mesothelioma, which will take place in three cities: Houston, San Francisco, and Chicago. In an effort to make it easier for the mesothelioma-affected community across the United States to access life-saving information provided directly from top experts in mesothelioma, in 2016 the International Symposium on Malignant Mesothelioma will consist of three individual conferences in three major cities: Houston, San Francisco, and Chicago. Each conference will be a self-contained one day event, including breakfast, lunch, and a cocktail hour, plus coffee breaks throughout the day. The Houston conference will be held in conjunction with the MD Anderson Cancer Center. The San Francisco one will be co-organized with the University of California San Francisco. The Chicago conference will be held in conjunction with the University of Chicago Medicine. The International Symposium on Malignant Mesothelioma was established in 2004 has been a source of vital information and support for thousands of families affected by mesothelioma. The conference is known for its focus on research advances, offering those in attendance the ability to obtain the most up-to-date treatment information from many top experts, all in one place. In 2015, the conference took place at the National Institutes of Health, in collaboration with the National Cancer Center, and featured over 160 experts in attendance and well over 400 attendees total. In 2017, the Symposium will be returning to Washington, DC and to the National Institutes of Health. More information about the 2016 events, as well as photos and videos from past events, can be found at http://www.curemeso.org/symposium. The Meso Foundation is the only 501(c)(3) nonprofit organization dedicated to eradicating mesothelioma and easing the suffering caused by this cancer. The Meso Foundation actively seeks philanthropic support to fund mesothelioma research; provide patient support services and education; and advocate Congress for increased federal funding for mesothelioma research. The Meso Foundation is the only non-government funder of peer-reviewed scientific research to develop life-saving treatments for this extremely aggressive cancer. To date, the Foundation has awarded over $9 million to research. More information is available at http://www.curemeso.org.